This talk requires previous knowledge on the subject. We, at Farfetch, have been running Data Science projects, in production, for the last 4 years. Our aim is to create agile, flexible teams that strike the right balance between delivering value to the platform, doing fundamental research and still having some time left for the cool-stuff(tm). In this talk we will go over some of those projects, how it impacts the business and what it actually means to do Data Science in this industry. 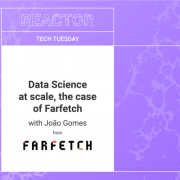 João Gomes is a Data Scientist at Farfetch. Since joining the company in 2015, he has helped design and build the in-house recommender system that provides personalized content in the platform. His mission is to help Data Science teams deliver working projects, on time, while maximizing the number of buzzwords he can fit in a powerpoint presentation. He holds a PhD in computational physics and an healthy, data-driven mistrust of people who are social before the first 2 cups of coffee of the day.